So on 7th I arrived in Paris, France. We landed at six o’clock in the morning. The plane ride went well...as well as plane ride can go. I watched a poorly dubbed version of the film, Mirror Mirror, in French. All of the semester girls were freaking out during the plane ride so of course we got no sleep…which made jet lag that much worse. We arrived on Charles De Gaulle Airport in Paris and got to spend the next six hours waiting for other exchange students to arrive. While we waited, I bought my first purchase in France…A giant pink macaroon! It was AMAZING! 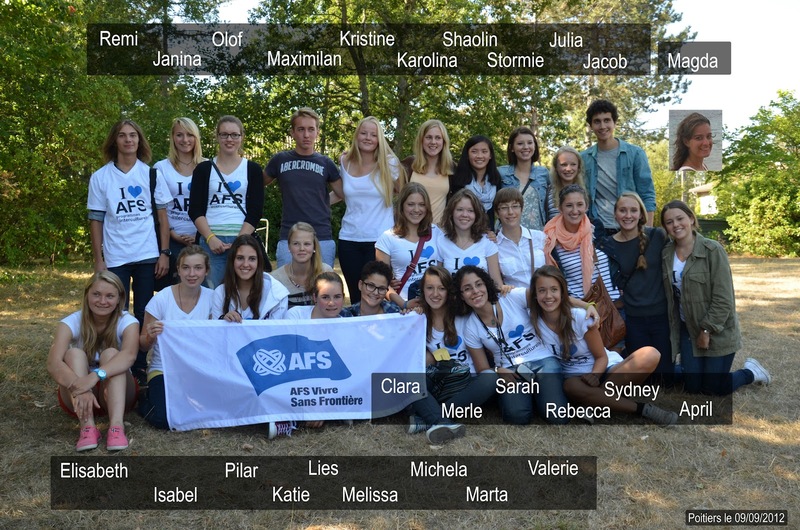 After waiting in the airport for what seemed like forever, all of the AFS kids took a bus to a youth hostel in Paris. Our orientation was two days, but it felt like forever because it everyone was too excited to meet their host families. But the orientation was really fun in spite of feeling super long. I got to meet so many cool kids from everywhere around the world. It was weird knowing that the language barrier between all of us would disappear by the end of this program. The best thing about the orientation was taking a tour of Paris. The second day of our orientation we got on a coach bus and toured the city. It was literally the most magnificent day (blue sky, perfect temperature, etc…) The best part of the tour was definitely the Eiffel Tower. It was so cool to finally see it in real life, not on google or in photos. 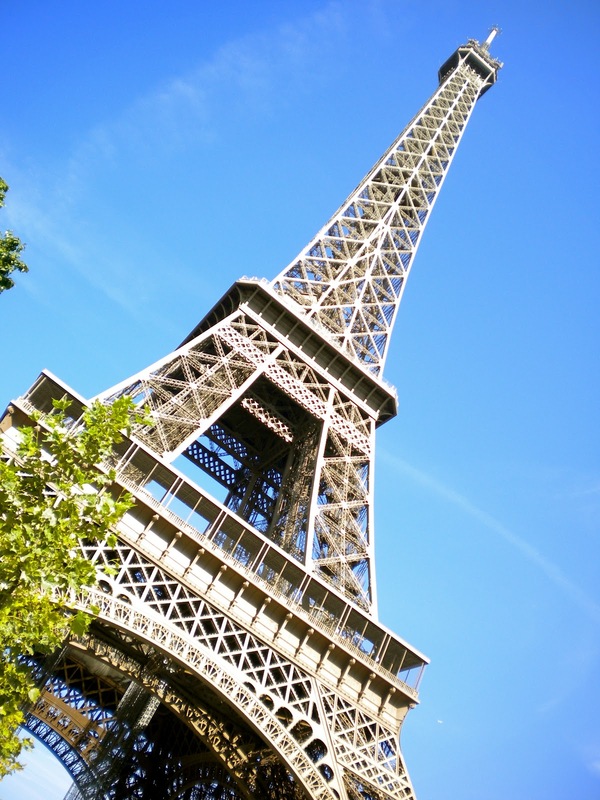 But the one thing weirded me out…Why did no one every tell me that the Eiffel Tower is BROWN!?!? I was so confused. My whole life I just assumed that it was grey or maybe made of steel. But I was super confused when we walked under the Eiffel Tower and it was brown! Despite that surprise, I was still super excited to be at the Eiffel Tower. Also, driving down the Champs Elysées and the Arc de Triumph was so cool. The whole time, every kept saying, “Oh my gosh, I saw a picture in my French textbook!” When we returned to the youth hostel, they gave us instructions on what to expect….which of course was very boring because all I could think about was meeting my family tomorrow. The next day, I had to get up early to catch the train to Pointier-Charente. The entire train ride, (which was only an hour and half!) I was freaking out. Sydney (a girl who is an AFS exchange student at my school in Châtellerault) and I kept thinking about how we were going to meet our host family soon. But, when I actually meet my family it was a huge relief. When I meet them, I realized that I was so lucky because I literally got the nicest and most beautiful family in France! My parents Anne-Cécile and Gilles are both so loving. And my sisters, (Elise, Mathlide, and Marine) are gorgeous and nice. And of course, my little brother, Louis, is adorable! After leaving the train station, all of the exchange students and their host families gathered at a youth hostel in Poitiers. We had a picnic in the backyard of the building. And of course, the food was amazing! Almost all of the food was specific to the region. After the picnic, we drove home to Châtellerault. The house is old and beautiful and is located two blocks from the centre-ville, (center part of town). I actually hardly remember my first night with my new family because I was so nervous and tired from jet lag. When I finally settled in it was nice to be done with all of the traveling. I was really excited to be in France but I didn’t realize that I had my first day of school the next day! I woke up at 5:00 that morning, realizing that I had set my clock to the wrong time zone. I couldn’t go back to sleep so I decided to take a shower. This presented a couple of problems because A) it was pitch black and I couldn’t find anything...including the light switch. B) The showers (like the shower head) are different in France so it took me about twenty minutes (NOT exaggerating) to figure out the foreign contraption. Don’t worry because in the end I finally figured it and was able to be ready in time for breakfast. The good news about Lycée is that it only starts about 8:00 am. (When I say about 8:00 am, I mean about “about” because the professor chooses whether they feel like starting at 8:00…maybe they want to come to class at 8:10. There isn’t enforcement on being punctual to class). Anyway, the bad news about Lycée is that it ends at 18:00 (6:00 pm). This meant that my first day was a very long day. I was nervous because I knew that being a new student is hard, but being a new student to a new country is extremely difficult. I was also very nervous because I am in Terminal and in a track that I knew nothing about. *In France there are certain tracks (like majors) that you chose when you enter Lycée. There are three options: Scientifiques, Economiques & Sociales, and Literature. I was put in TES (Terminale in the track of Economiques & Sociales) so I could be with another exchange student. I am all of the same classes as a girl, Ólóf, who is from Iceland. She came to France speaking no French. So school is an adventure for both of us! Anyway, I had math class first. I thought it would be a breeze, right? Not so. Not only do they use different calculators but they also use completely different symbols! And all of the numbers are written differently and to top it off everything is written in cursive!!! And so I spent all class staring blankly at the board…and I spent the rest of the day staring blankly at the board. But despite understanding nothing, everyone was understanding. The students in my class bombarded me with questions about America. The best part of the day was lunch. At lycée, we get 1 to 2 hours for lunch depending on the day. Lunch is the largest and most important meal in France so the school offers a ton of different options. And the food is amazing!!! It’s all fresh and there is always plenty of it. It is so nice to have a pause during the day. Another great thing about school here is that the warning bell is the theme song to the Pink Pather!!! When I heard it, I almost died of laughter. After school was over, I walked home with my sisters. (We walk to and from school because we live 10 minutes away by walking.) That evening was really hard for me because it was so frustrating understanding everyone but not being able to communicate my thoughts. I was also really homesick. The next day was much better. I was much more relaxed and knew what to expect so it made everything a little easier. Plus, on Tuesday I had one class in the afternoon so I was able to explore town for a bit. I bought some nutella2go which was definitely the best find and highlight of that day. On Wednesday, we don’t have school on the afternoon so I got to go home early and eat dinner with the family! Even though classes go until 18:00 here, it’s definitely a plus that we have Wednesday afternoons off. Also, for dinner on Wednesday night we had Ratatouille! Like the real deal…in France! It was so delicious! After dinner, Gilles asked me if I knew about any French singers. When I mentioned that I knew of Joe Dassin, he got the lyrics of “Champs Elysées” on a laptop for me and pulled out his guitar. The family gathered around the table and started singing. It was so cute! Gah, I love the Roure family! The next day was pretty much the exact same as before. When I came home from school, Mathlide was eating a sandwich that was literally white bread, butter, and dark chocolate. I thought it was kinda bizarre, but I didn’t think anything of it until everyone started doing it! I can’t believe that chocolate and bread it considered normal! There is SO much chocolate in France! (Well, at least in Châtellerault…) In the morning, there is baguette with nutella. For lunch there is some chocolate yogurt. For after school snack, there a variety of chocolate snack available. And finally for dinner, there is another chocolate yogurt! I understand now that the reason there is so much chocolate is because chocolate is so cheap here! It’s 2 euros for a pack of three huge Lindt bars. Friday, I woke up and realized that it was 10:30! I was so confused how I could’ve have slept through my alarm and I was even more confused why my family hadn’t checked that I was awake. I got ready as soon as possible and literally ran to school to make it class. When I got there, I realized that my clock was off by an hour and so I had made just on time for my first class of the day. I had English class that morning and then I had no classes for three hours! Ólóf and I have the exact same schedule so we decided to go to supermarket instead of eating lunch at school. We got cocoa cola, baguettes, and chocolate and walked around Châtellerault while we ate. We also went shopping after we ate. We returned to school to have math for three hours straight! It was horrible! But, in the end Friday was a pretty good day. Saturday (Today) was fantastic. Yesterday, Marine came home from the University to visit for the weekend. It was great finally meeting her! And thanks to her, I finished my homework in the morning (as I had no idea what was going on in math…). We went shopping in the afternoon. I had to get a lot of things and so we went a number of stores. I don’t know if this if bad or good, but everything had British or American flags on it! Of all of clothing I saw today, I found only one t-shirt with French writing on it! The rest is in English and is usually some poorly translated lyric from an American pop song. I was also super surprised when we discovered a t-shirt that said “Minnesota High School” on it! That was definitely the best find of the day! Also, I bought some BENSIMON shoes, which are like the European version of Keds/Converse. So now I feel like a real European! Well, I think that covers just about everything from the past week! I need to be better about updating this blog in the future…hmm.